We’re still waiting for spring around here but most of the snow is out of the front yard and The Female Human says the ski area will close this weekend (not that felines ski, mind you). While we wait for flowers to pop up, the sun to shine and some quality outdoor time in our catio, Oliver is busy griping about not being able to go out and Lily is trying to figure out how to get comfortable with a pillow that isn’t exactly placed in a comfortable position. I hope you enjoy this week’s web wanderings and here’s to walking in a real garden very soon! You humans have been perpetrating false information about felines for years and bless my whiskers; someone finally has addressed this issue. 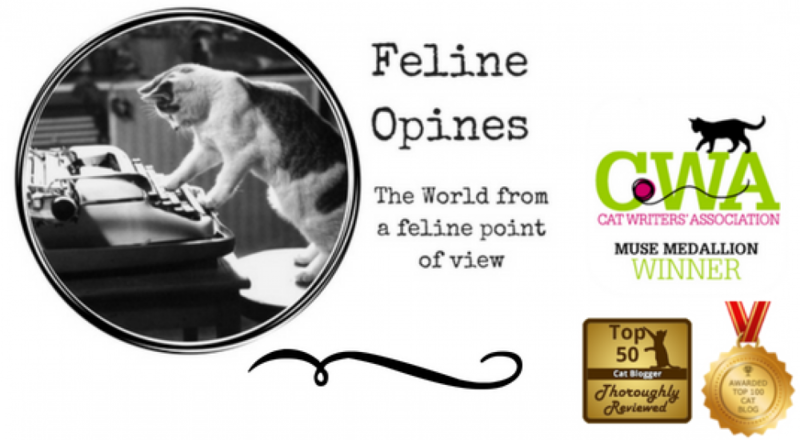 This article debunks 14 very common myths about the fabulous feline. For instance, the one that says cats don’t like water. What a bunch of malarkey. I love water and get in the shower whenever I’m allowed. I like to hang out by the kitchen faucet and will take any opportunity to hang out in water. And that falsehood about how we cats see perfectly in total darkness? Malarkey! We need a little bit of light to see because our eyes gather the light in and then it intensifies in a membrane called tapetum. We are purrfectly designed to hunt prey in low light situations. So please read this article and spread the word that everything people say about cats isn’t true! Does Your Cat Really See You as Its Mama? Now that I’ve talked about things that aren’t true about cats, here are some things that are. First, we felines see you humans as another big, non-hostile feline. Most of our interactions with you humans is driven by our instinct more than any behavior we’ve learned. For instance, when we knead on you (also referred to as “making biscuits”) it’s a behavior we do on our mother’s bellies to keep the milk flowing. When we greet you when you get home and our tail is upright, this is a universal feline sign of friendship that we reserve for only non-hostile felines. And if we bring you dead things, it’s not because we’re bringing you a present, it’s because we want to feed you. You humans really need to read this article and find out what’s behind the things we do! While I’m on a roll debunking feline myths and sharing feline facts, this also needs to be said. Yes, cats DO fetch (3 of the 5 members of our tribe are fetchers). When NPR.org posted a headline comparing the fetching abilities of cats and dogs there was quite a kerfuffle and many humans set NPR straight right away. Now most of the humans did say that their feline fetches…only when he wants to. The pro-dog contingency said dogs fetch because of their deep desire to please their humans, understanding that the more they please their humans the more benefits they receive. We felines, on the other hand, are not so interested in the pleasing idea. Still experts say that big felines in the wild are probably more prone to fetching and bringing things to you that many dogs. And if any of you are still skeptical about felines fetching things, take a moment to watch this video. You know who much this feline reporter loves stories about creative events for shelters and this one is creative. Companion Animal Foundation and Sangha Tattoo Studio in Humboldt County, California partnered up with Paws for A Cause: Give ’til it Hurts. The Tattoo studio held a soiree with food, drink and furry feline guests who were available for adoption. The cash from the event was used to benefit CAF’s Mobile Vet Clinic Fund. Now that is a purrfectly creative event and, lest you think it’s not a great money raiser, Sangha Tattoo Studio posted on their Facebook page that they raised $2,725.00!! When the molecular geneticist Daniel Ibrahim met Lil Bub for the first time he became interested in social media famous felines. The next morning he headed over to a colleague’s office and showed him the Lil Bub video. He was purrticularily fascinated with the part of the video where Lil Bub’s veterinarian examined her X-rays and commented on the rare genetic limb malformation disorder that Ibrahim and his colleague were studying. They compared Lil Bub’s DNA to a stockpile of 131 cat genomes, compiled by the 99 Lives consortium—the world’s largest feline DNA database. None of those cats had Bub’s RANKmutation. Leslie Lyons, who started 99 Lives at the University of Missouri in 2014, says that Bub’s DNA is likely to help doctors better identify and treat patients of osteopetrosis. But more than that, she’s hoping it will inspire more cat owners to get their animals sequenced. (And speaking of DNA, our own Lily is currently awaiting her DNA profile from Basepaws. Now, five years later, with the help of a very successful crowdfunding campaign the scientists discovered the reason behind her signature squee-ness—extra toes, short stature, wonky gait, and a tongue that is forever lolling out of her mouth. Their discovery, which they posted in February, is not only helping Lil Bub’s human care for her as she ages, it could one day aid doctors in better treating human patients of osteopetrosis. And just as Bub blazed a trail for viral cat celebrity, by having her DNA sequenced she is once again leading the way, only this time toward precision veterinary medicine. Way to go Lil Bub, you are making feline genetic history! Actually, i’ve been a cat servant long enough that i knew those 14 myths were, well, myths. In fact, i like to teach people who like cats about the word crepuscular, most find it quite amusing. It figures that cats see us as just big, and somewhat clumsy compared to you, cats. That’s probably also what you think of dogs you like. Our local shelter is having our annual fundraiser bowling tournament soon, and we have sponsored nights at various restaurants and venues that raise money for us. Never though of tattoos, though. Hooray for Lil Bub helping with scientific research! I love lil Bub. Great collection of articles. Yes, those myths were sure busted!!! Great ones Oliver! There is a cat tattoo fundraiser in Chicago, Illinois too, and it’s easier to get to Chicago from the Detroit area for me, but I haven’t done it yet! Getting a cat tat is on my ‘to do’ list! I am glad that Lil Bub is helping other cats and humans; she’s a living doll! Thanks for sharing these stories…we missed a couple of them.